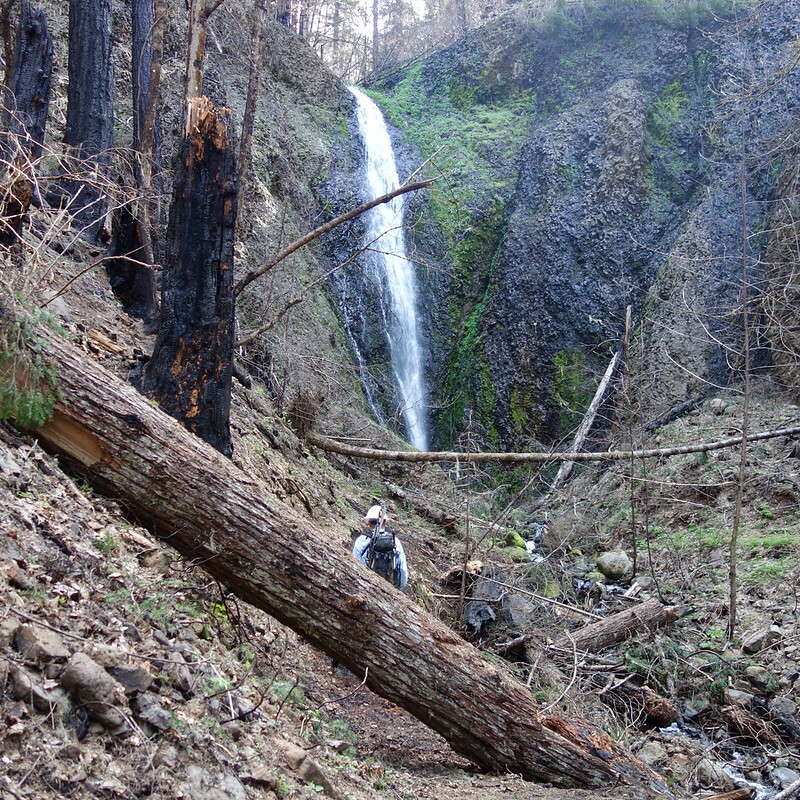 Trail Work in the Eagle Creek Burn, Pt. 1 – Hi, Alpine. 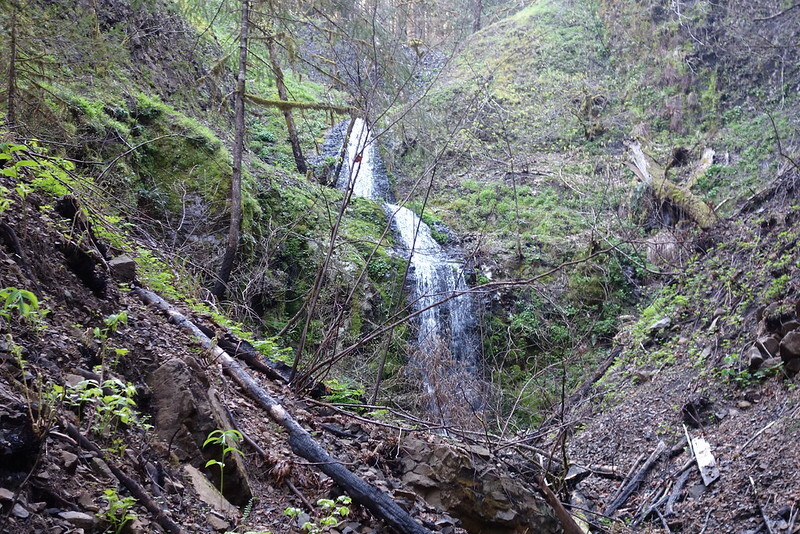 This spring, I’ve been doing some work to help restore the trails hit by the Eagle Creek Burn last September. 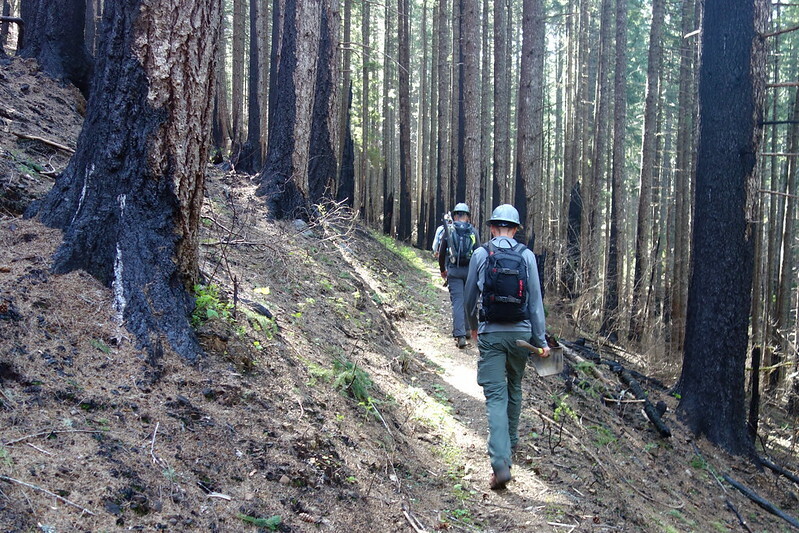 Please note that the trips described in this post were with crews that had special permission to enter the burn zone. As of now, the area remains closed to public entry. Please don’t go there. I am not, it happens, a pro. After a few trailhead preliminaries, we walk single-file up an old road along Gorton Creek, as the trailhead green shifts to a patchy black. The Wyeth Trail cuts off to the east, but you’d never know it, because the whole thing is buried under several feet of slide. This is my first time in the burn, and it’s taking everything I have not to break out crying. It’s not sadness, exactly, because I know fire’s natural here. It’s more… it’s the simultaneous realizations that what I’ve loved here for so long has irrevocably changed, but also that, despite my fears, what I’ve loved here for so long is still here. We reach the beautiful old bridge over Gorton Creek, and stop for a moment to take a look. 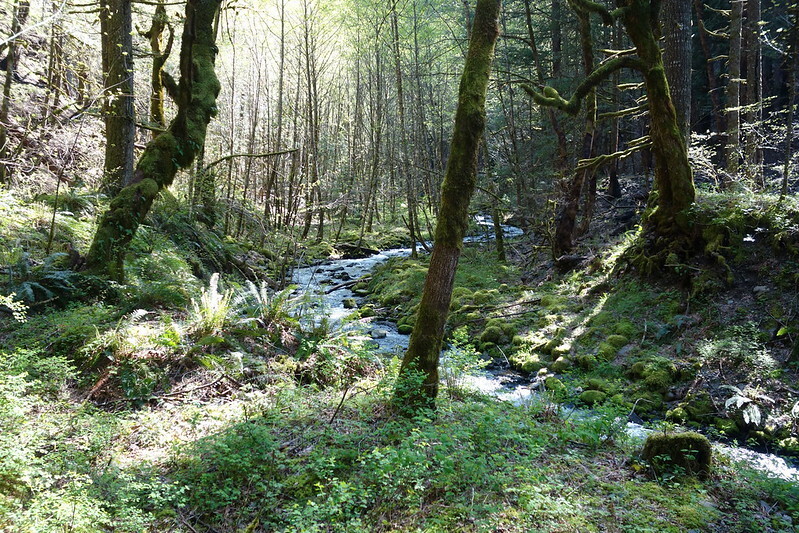 The creek meanders through thin forest, some burned, some still bright green. The first time I came here, years ago, it was an early morning in early autumn. 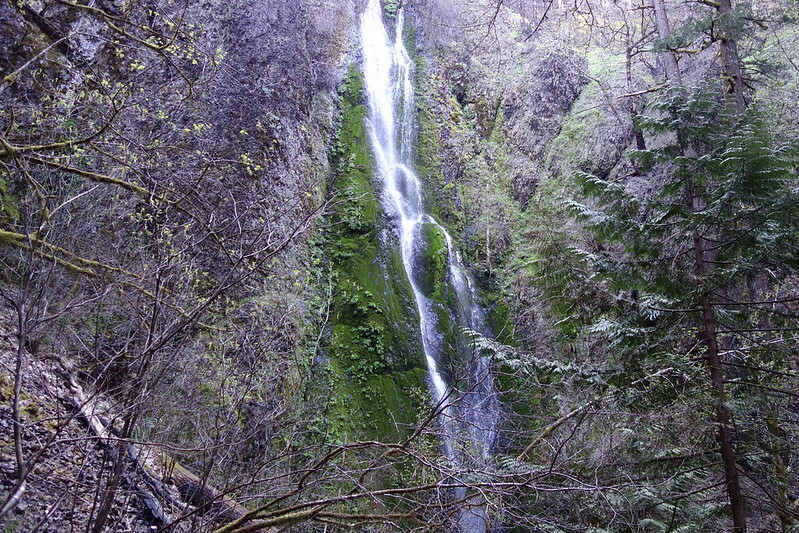 I’d been jogging east from Herman Creek, and didn’t at all know what to expect. 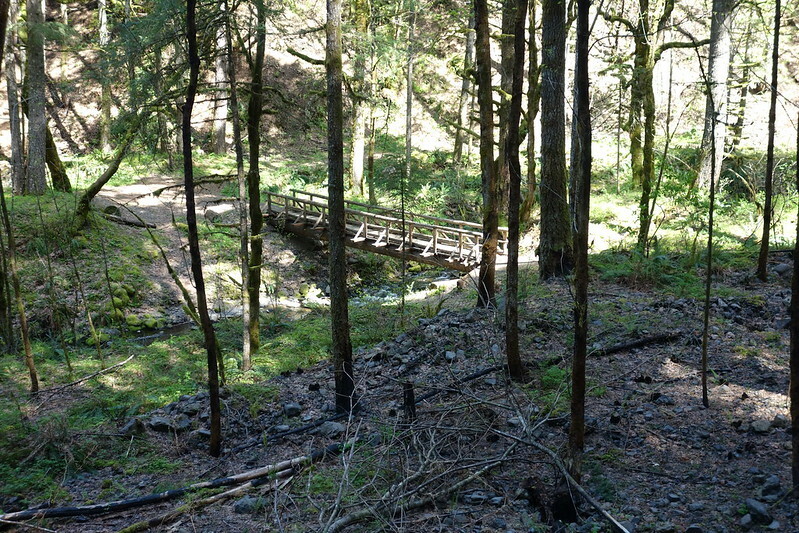 Turning a corner on Trail 400 and seeing the creek and this bridge felt like finding a secret, a primeval place just off the freeway. I almost expected to see a dinosaur, or at least hear a whistle from the trains that used to stop here on their ways from Hood River to Portland. I remember sitting in the center of the bridge, feet dangling, and eating breakfast, feeling like the richest person in the world. Standing in that same spot now, I think about what I didn’t understand then. 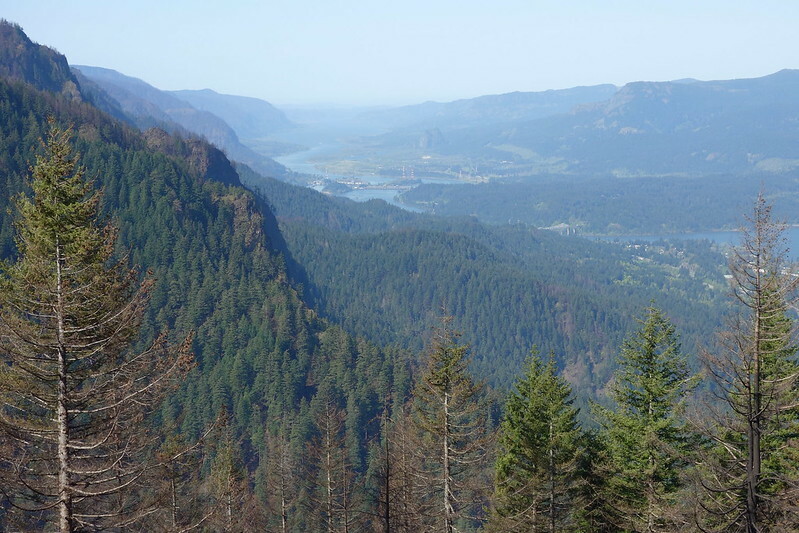 I’d watched the Gorge cycle through the seasons, but I didn’t understand that other, longer cycles were in play too—that, whether by lightning or a careless kid, fire would come, just as naturally as winter. 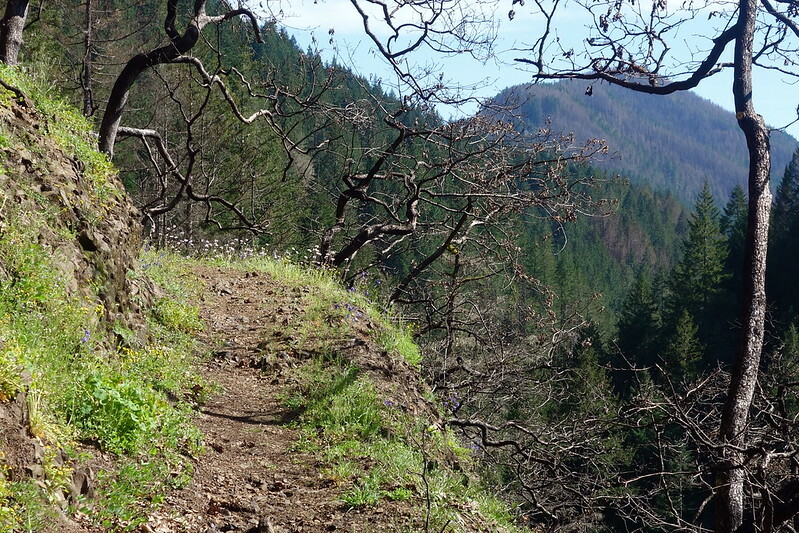 The actual trail work turns out to be delightful. We rake rocks off the tread, then clear debris out of drains, and beat the berm off the trail’s edge. I’m bad at it at first: clumsy and insecure, furtively watching everyone else to figure out how to proceed. Everyone else seems more experienced than me. But they’re also unbelievably helpful, quick with advice and encouragement and gentle redirection. We work west up and around a ridge, then on, clearing tread in a shallow dry drainage. Several trees have fallen across the trail, which our instructors show us how to cut. I’m a little at sea but watch carefully. Apparently, I was right about those saws: they’re for cutting after all. Toward the end of the day, we walk further west onto a talus field to clear the limbs of a massive fallen tree. It’ll take a sawyer crew more experienced than us to cut the tree proper, but we can help clean it up to make their job easier. Spring birds are out, singing to each other. There’s a quiet moment, and I hear I pika “meep” somewhere up slope. 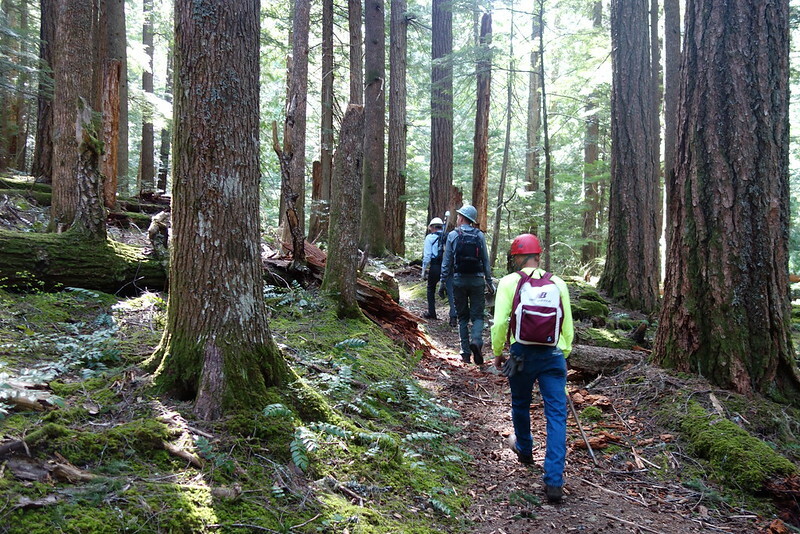 A few days later I’m with another crew, this time walking up Herman Creek. The plan is to try and find the southern edge of the burn. Many crews have already been through, clearing trees and tread, so the walking’s easy at first. 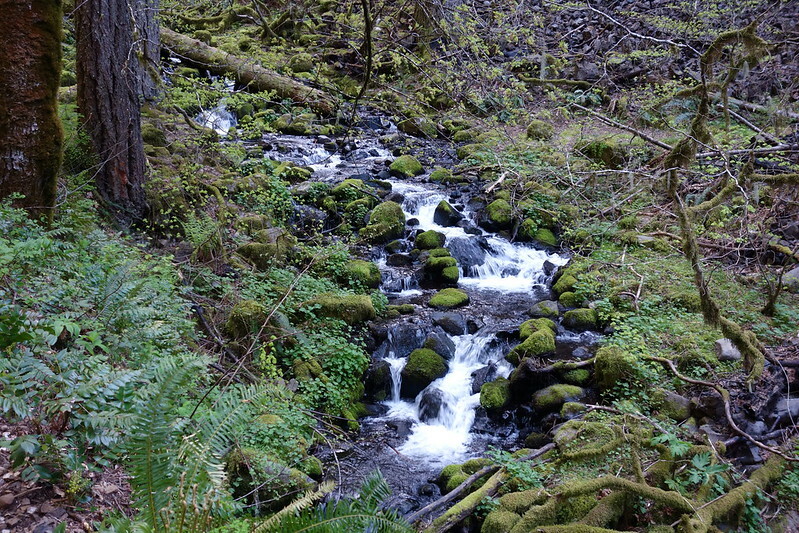 I shouldn’t be, but I’m surprised to find the feeder streams all intact, all lined with green, even when the surrounding forest is burned black. I think of a rainy winter solstice here with my dad when I was still in my twenties. We got to the trailhead late, then stubbornly stayed on all the way to Cedar Swamp, and returned with headlamps. I think it might have been the first time I ever hiked like that, in the dark. We pass out of the area where previous crews have been and are immediately confronted with tangles of blown down trees. The tread is often covered by fallen rock or rotting wood. But it doesn’t last long. 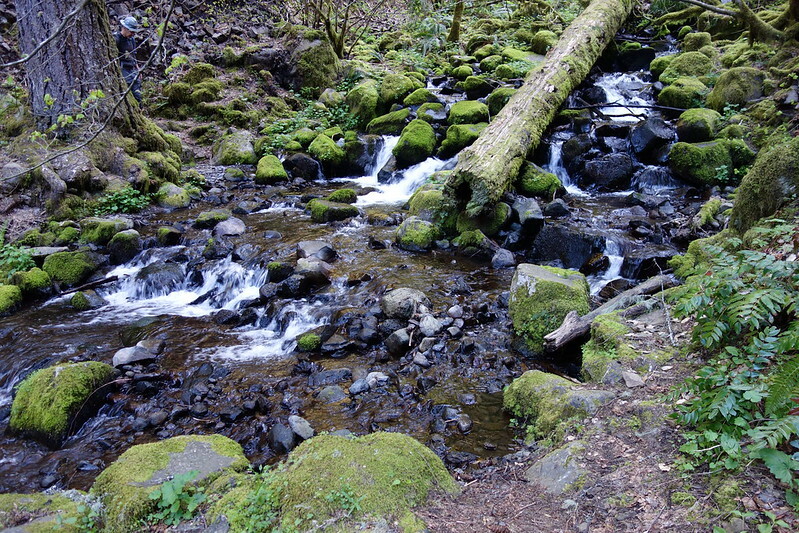 We cross Whiskey Creek and the forest returns: ancient trees covered in ancient moss, every possible shade of green. 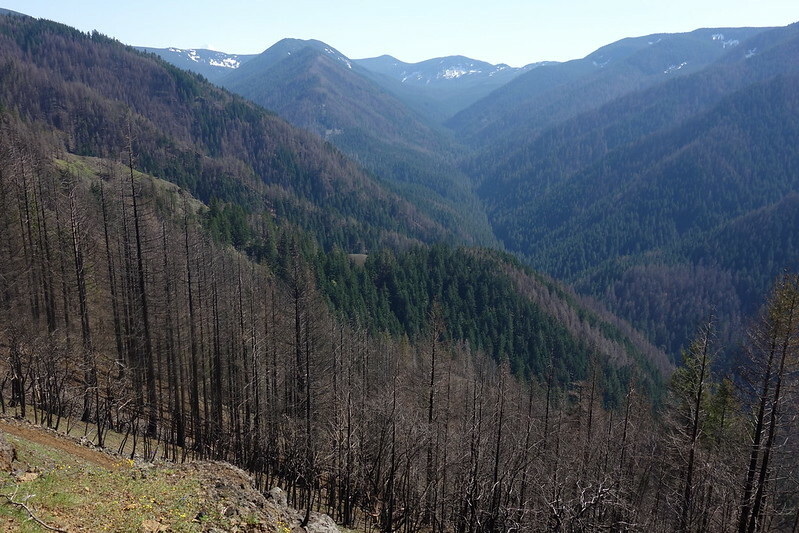 They want us to make sure that the fire didn’t jump further up, so we continue on for a bit, as the old growth grows thicker. But the black burn never returns. This is it. We walk back into the burn and start work: clearing tread, cutting fallen trees, and filling the sinkholes left by burned roots. It’s hard, dusty work. Almost instantly, there’s a thin layer of ash over everything. There’s a journalist along for the day, and he wants to ask me a few questions. I’m not confident at my ability to answer well, but figure maybe he’ll edit out the bad bits and leave me sounding better than I do in real life. He asks about what it was like seeing the burn for the first time. I tell him a bunch of stuff, but the part I hope he keeps is that it felt like I was learning something new about this place: that I still love it exactly as I did before, but that I understand the thing I’ve always loved better now. A few days later I’m on another crew, now headed up Nick Eaton Ridge. Slowly, I think I’m getting the hang of this stuff. I know how to carry my tool correctly. I’m certain now that saws are for cutting, and I’ve even used one a few times. It helps that most of the work this morning is just walking up a steep hill. I’m pretty good at walking. My first time here was in the pre-dawn dark on my 30th birthday, I celebrated by hiking 30 miles in a day, the first time I’d ever done that. I had a tent in my daypack because I wasn’t sure if I could do the distance in a single day, and enough food for a weekend. 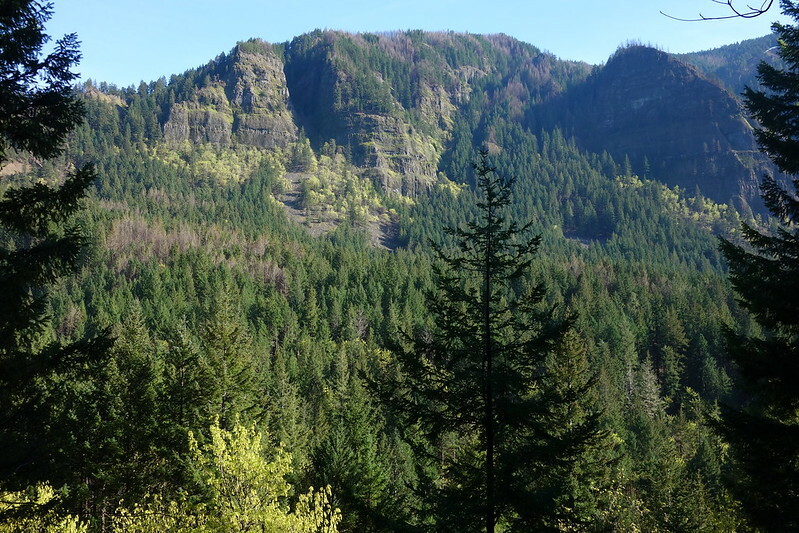 I remember watching the sun rise on the river from this ridge, the light climbing up the solid green valley. 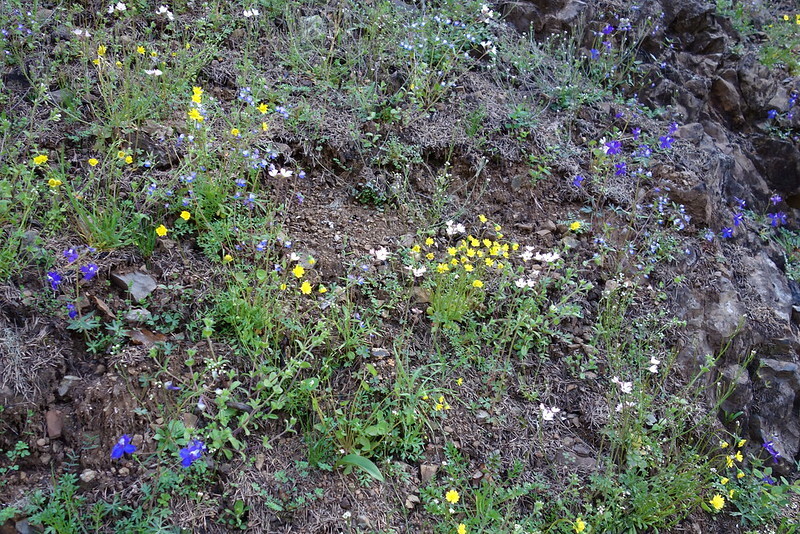 The valley’s not solid green anymore: it’s a mosaic of green and brown. But there’s more green than I thought there’d be, and anyway it hasn’t even been a year. I think of watching more sunrises here as the years ago on, watching things go green again. When I did that hike on my 30th, people asked me if I wasn’t starting a dangerous trend. What would I do when I turned 60? With any luck, I’ll come back here. 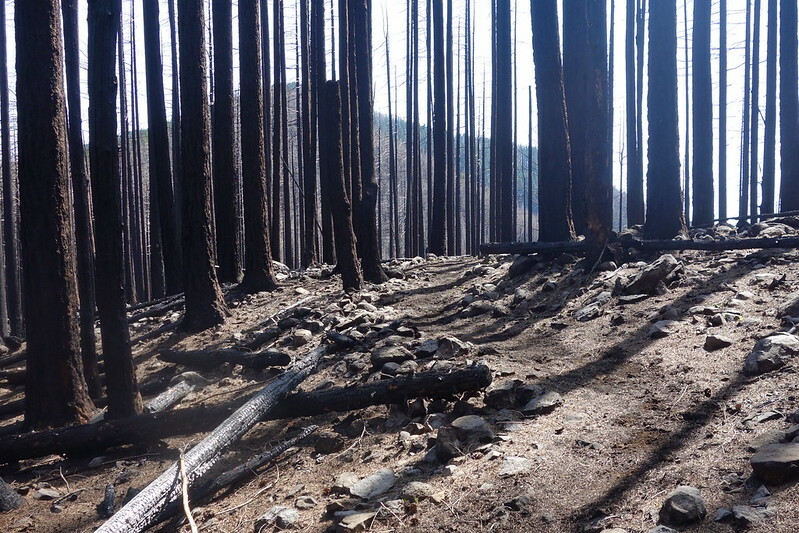 The fire hit hard here, and we work for hours reconstructing a short section of trail that’s just… gone, cutting and grading new tread. We lunch at the edge of a small wooded dip in the ridge, then spend the afternoon trying to define a trail through the rocky ash. I remember losing the trail on that birthday years ago. It was buried in bear grass. Then I remember something I saw on Inciweb a little while ago: new bear grass sprouting a few ridges east of here, above Tanner Creek. Apparently it’s one of the first things to come back. 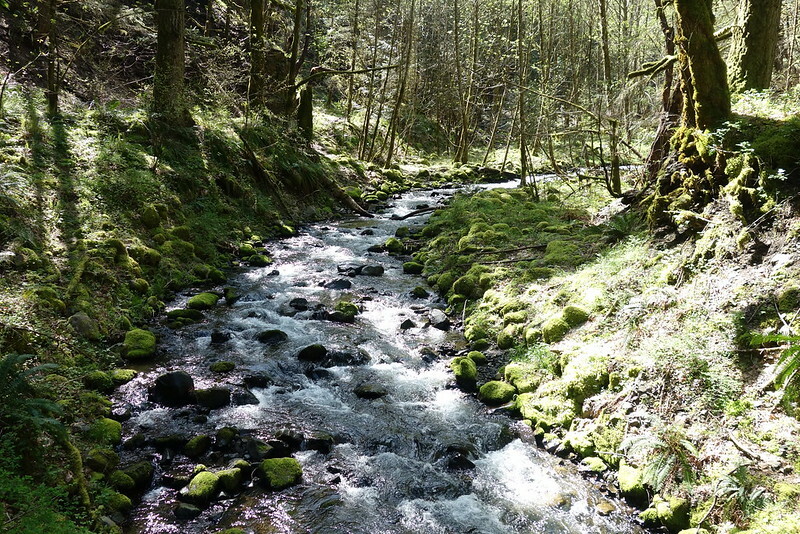 It’s a sunny morning on Tanner Creek, two weeks later. 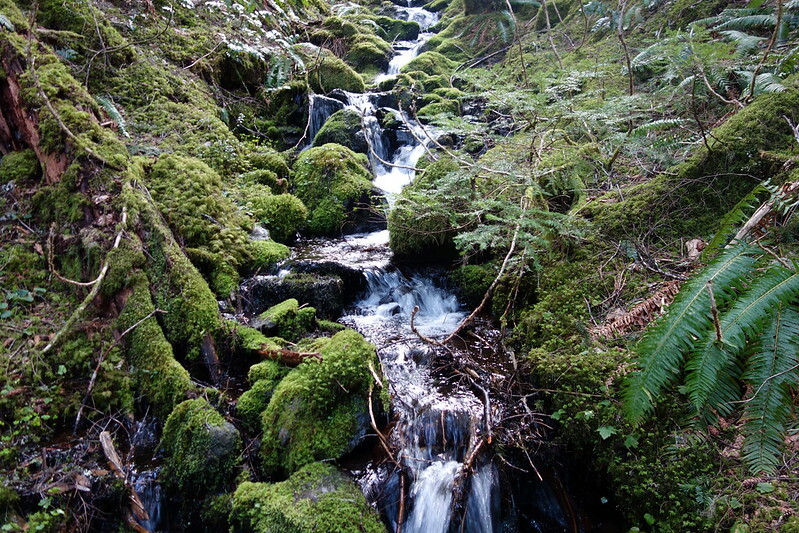 The Tanner drainage was one of the hardest—perhaps the hardest—hit by the fire, but even here areas of green remain at the corners of the creek. In places, the trail’s buried under several feet of rock. Digging it out, it’s not always clear when—or if—we’ll hit the original tread. Every once in a while, someone will yell that they’ve found the trail, and we’ll all celebrate, as though they’ve found gold. 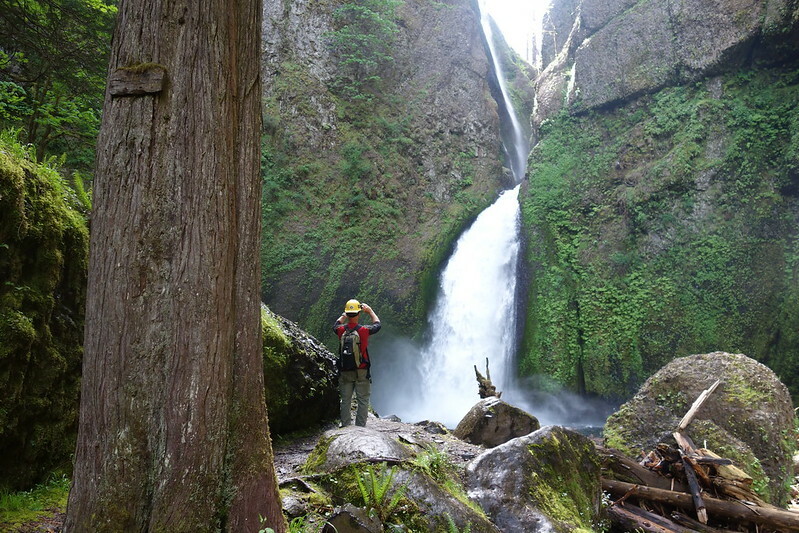 We work our way through rock and mud slides until it’s time for lunch, then walk down to the falls, and sit around, resting, eating in silence but for the water’s roar. 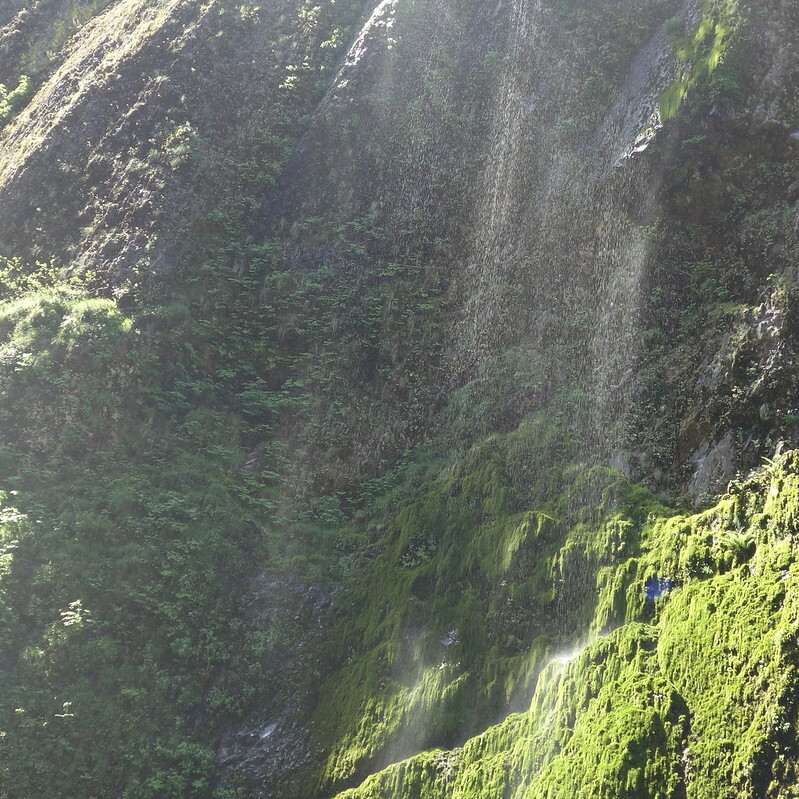 The fire burned hot on the ridge just east of here, but in the canyon it’s all green, still covered in moss. A couple days later, we’re in the canyon again and someone startles a great blue heron that’s apparently been sitting unseen in the creek below. It flaps up noisily, then glides through the canyon, just barely above the water. Watching it fly is like watching a dinosaur.